A sports lounge equipped with a huge screen that airs sport programs, up-beat music and professional billiard tables and a beverage bar open in the evening. Red Night Club entertains guests every night with its vibrant performances, singing waiters, dance music and light meals. The club is open until late at night. Four swimming pools, kiddie pool, snack-bar with drinks and light meals are available for guests' enjoyment. The fitness room and spa at Vitalis may be used for an additional fee. Use of the sophisticated spa facilities and a variety of treatments at Vitalis may be enjoyed for an additional fee. The hotel provides religious services to our observant and traditional guests. H.Stern Jewelry Store, souvenir and newspaper shop, beauty products store, a business room and the Victoria Kazal Jewelry Store are conveniently located at the hotel. The Herods Forum - Sheraton Convention Center Eilat, is located across from Herods Palace, linked by an elevated walk way. 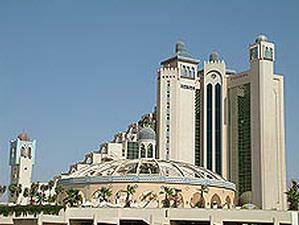 The hotel is located on the beachfront of Eilat's North Shore.